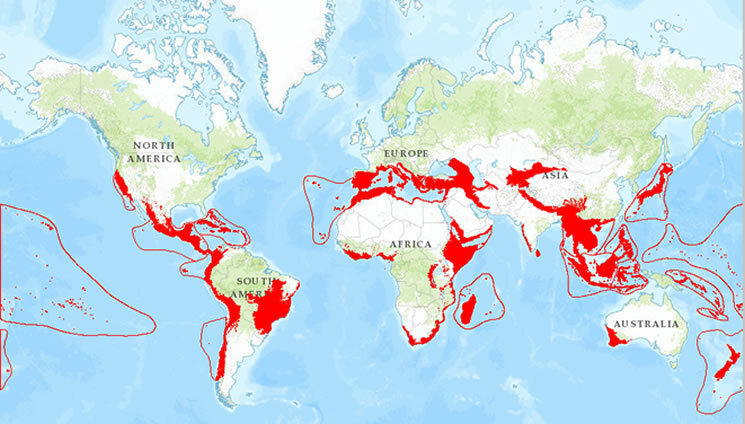 Biodiversity hotspots. What are they? Photo courtesy: The Conservation Biology Institute (CBI). Looking at the map above, do you notice a trend in where biodiversity hotspots are generally located? What are some characteristics of regions or landforms that are biodiversity hotspots? If you look to the islands of Earth, you can see that they are primarily in red. Why care about biodiversity hotspots? A threatened species is one that is at threat of becoming an endangered species. An endangered species is a plant or animal species that is at risk of going extinct. This means there are very little individuals left on Earth that are likely to be reduced to no individuals at all. Some of the major threats to endangered species are habitat loss, hunting and poaching, invasive species, diseases, and climate change. At the moment, extinction rate is thought to be occurring at a much faster rate than the excepted natural extinction rate. Large amounts of species are going extinct before they are even discovered! Endangered species typically have small population's sizes or have limited range and distribution. This means species may be especially vulnerable to threats and be wiped out.5 Once a species is wiped out to extinction, they cannot be brought back to existence. We need to become more proactive about conserving and managing endangered species before go extinct. 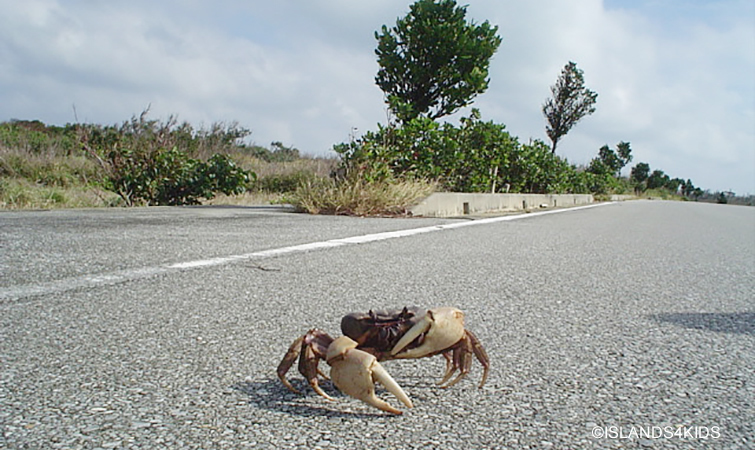 Oka-gani (crabs that live on land ) inhabit Ikema Island, Okinawa. From May to October, they cross the road to go to the beach to spawn eggs on nights with a full moon. Oka-gani can cross the road safely. 1. Conservation International. n.d. “The Biodiversity Hotspots”. Conservation International.http://www.conservation.org/where/priority_areas/hotspots/Pages/hotspots_main.aspx. 2. California Biodiversity Council. 2007. “What is Biodiversity?” University of California Agriculture and Natural Resources. http://biodiversity.ca.gov/Biodiversity/biodiv_definition.html. 3. Conservation Biology Institute. 2004. “Biodiversity Hotspots Revisited. Conservation International. http://databasin.org/datasets/e5e1b415498249d0b511b0eef8625c12. 4. Convention on Biological Divserity. n.d. “What is Island Biodiversity?” United Nations Environment Programme. http://www.cbd.int/island/intro.shtml. 5. Arkive. 2014. “Endangered Species Fact File”. Wildscreen. http://www.arkive.org/endangered-species/. 6.Convention on Biological Divserity. n.d. “Island Biodiversity – Why is it important?” United Nations Environment Programme. https://www.cbd.int/island/whymatters.shtml. Copyright © 2014 - 2019 Islands4Kids. All Rights Reserved.